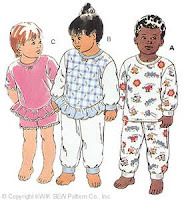 If anyone wants to try their hand at making PJ's for their kids try Kwik Sew # 2315 (for knits only - get a ball point or a universal needle for your machine). This could easily be your first sewing project - it's that easy. The pants are one pattern piece + ribbing for the cuffs. The only tricky part is putting on the ribbing (in the tight areas especially like the sleeves). Just remember to turn it right side out first. I have this patern in sizes 1-4 which fits kids from 31-40 " tall. It's easy to lengthen/shorten the legs, rise (for diapers), sleeves, and body to custom fit as well. All you need is a ruler. Kwik Sew has the BEST directions. NOTE: This pattern 2315 is not longer listed but it is almost the same as Kwik Sew 3510.